The report talks about additional funding for carers for medical, housing and transport costs, but it doesn’t talk about people with disabilities needing more money for medical, housing and transport costs. It is just assumed that we all have a carer who takes care of everyday life necessities. The report talks about the need for additional training for carers, but not about educational opportunities for PWD. The purported disability insurance scheme is proposed to apply only to people who are catastrophically injured, not people who are ill, who have congenital disabilities, and so on – no matter how severe their illness or major their impairments. The ObesityCrisis(tm) looms large at the summit. What mention there is of the determinants of health looks at ObesityCrisis(tm), alcohol and drug use, and Indigenous health and gap-closing (an excellent focus in itself, and an area of major need, though what we call “healthcare” isn’t necessarily the solution). Mental health gets a passing mention. Is it as if no one ever has health issues that aren’t caused by indigeneity, fat, or drugs. The link between poverty and health is not drawn. The only nod to the “stuff happens” theory of disability is the injury insurance scheme. Otherwise, it’s all “personal responsibility”. There is a mention of making physical exercise mandatory in the workplace, perhaps with the Japanese schema in mind, something many PWD would find difficult or impossible. Do we really need to be further stigmatised in the workforce? All of the health focus is on preventive healthcare, as though by making certain choices, disability will never happen. Under preventive health policy, there is the rather dramatic and threatening note that there should be “zero tolerance of unhealthy actions“, whatever these may be. I think there is some magical thinking going on here. The only conclusion to be drawn is that the Summitariat choose to believe that if you’re white and watch what you eat, you will be invincible, immortal, shiny, and endowed with super-powers. I can understand the attraction of this sort of mindset, to a group of able-bodied people. Who doesn’t want to think that they have control over their own super-powers? I sure did, as a Temporary Abled-bodied young ‘un. And the corollary is: a focus on individual “health behaviour”, and on standard-issue good health, as a moral imperative. Healthism. You’re soaking in it. Like medicine, healthism situates the problem of health and disease at the level of the individual. Solutions are formulated at that level as well. To the extent that healthism shapes popular beliefs, we will continue to have a non-political, and therefore, ultimately ineffective conception and strategy of health promotion. Further, by elevating health to a super value, a metaphor for all that is good in life, healthism reinforces the privatization of the struggle for generalized well-being. Not only are we told we are individually responsible for our own health (with a hefty side serve of blame), but we have a moral responsibility to others to not have disabilities. This type of “public health” rhetoric is nothing more than a reiteration of that individualistic approach, with the addition of a value judgement and a one-way obligation. Our ill health is a slap in the face to all right-thinking people. Our “wellness footprint” is going right there on our citizen report cards along with our carbon footprint. Ill health is a result of immoral decision-making. Big Brother is watching you, missy, up and give me twenty! Is anyone else seeing a healthist Brave New World here? I’m finding this all rather chilling. There is a ritual that when someone develops an illness, their lifestyle is pored over looking for a choice that puts them at fault. If you have friends or family members who have developed heart disease or cancer, or if you have yourself, you will have noticed this. Only if ill people are found to have been unstintingly virtuous are they be considered a “good” sick person, with a moral clean slate. The rise of moralistic healthism can only mean further marginalisation for PWD who don’t fall into the “good crip” bucket. – are thin and conventionally sexually attractive, yet display no sexual feelings or behaviour of their own (perhaps apart from conventional heterosexual marriage). – are plucky, heroic, unfailingly optimistic victims of tragedy. What happens to transgressors, to PWD who deviate from the plucky-victim script? Are we punished? Outcast? Ignored? Where do we fit? There is another societally-accepted script: the silent, identity-less crip as the foil for the self-sacrificing carer-martyr. The cute, tragic, silent, infantilised, ‘pillow angel’; ascribed no agency at all. The carer is also deprived of agency and identity in this stereotypical script, subsumed into the notion of “carer”, with no life of their own; a double tragedy. But the reality is, people with disabilities are far more varied and complicated, not a collection of conveniently-cliched characters in morality plays and Hallmark specials. Some of us have carer responsibilities ourselves. And hobbies. And political ideas. And social lives. We are not potplants, pets, malingerers, inspirations, handfuls, beds, wheelchairs, freakshows, mascots, superheroes, or angels. Just people. With lives that aren’t reducible to being an economic unit or someone else’s encumbrance. There are some things we can’t fix; we have to live with them. And we don’t become objects or burdens in that process, we are subjects. We have an outlook on the world. Readers here know that objectification of women is a problem – well, check out the objectification of women with disabilities. We are here, we are not going away, we have voices that need to be heard, we are part of this conversation. And one day – maybe tomorrow, maybe in fifty years – odds are, you will become one of us. Talking about health and disability policy without substantial input from people with a wide range of disabilities is a paternalistic farce. 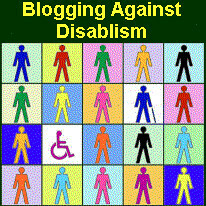 Before even starting to form a disability policy, a whole lot of people need to go back a step. Just as you can’t form a coherent, reasonable women’s policy without feminism (the radical notion that women are people), you can’t form a coherent, reasonable disability policy without disability activism. The radical notion that people with disabilities are people.